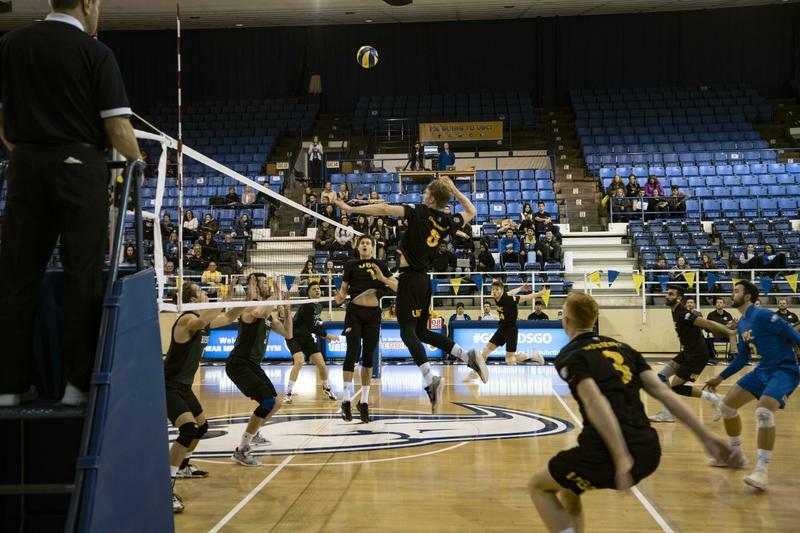 Surrounded by families and supportive fans, the UBC men’s volleyball team completed their last regular season game at War Memorial Gym on Saturday night. Although the outcome wasn’t in the T-Birds favour — a 3-2 loss to the Saskatchewan Huskies — UBC still finished in second place in the league, only two points behind the Trinity Western Spartans. For the dedicated men’s volleyball fans out there, you are likely familiar with the veteran faces on the team. For this year’s regular season finale, the starting line up featured a handful of those names: captain Irvan Brar, Matt Guidi, Joel Regehr, Ben Chow and Byron Keturakis — many of whom are graduating this year. For graduating player Keith West, it was a bittersweet night as one of five players leaving the roster post-playoff run. Others heading into their last few games with UBC are Brar, Guidi, Chow and Matt Santema. The ’Birds initially took charge of the match. As Guidi controlled the court with his consistent back row attack alongside Brar’s efficient kills, the T-Birds built up a monstrous attack line that fazed the Huskies. Putting up 13 kills in total, UBC took the first set 25-17. However, the T-Birds lost momentum in the next two frames. With 13 attack errors through the second and third sets, the T-Birds fell behind with losses of 21-25 and 25-27. To deal with the pressuring Huskies, the Thunderbirds tried to shift their game plan throughout the night, giving their bench a go at the court. The last two sets saw Jordan Deshane and rookie Coltyn Liu stand out from the team — not only because they helped claim the fourth set 25-21, but also collectively contributing seven kills in the last two sets. Their effort couldn’t overturn the evident balance on the court favouring Saskatchewan. After an attack error from Joel Regehr, the Huskies closed out the match with two kills and a fifth set score of 13-15. Although UBC didn’t manage to claim a victory, UBC head coach Kerry MacDonald is confident about the playoffs starting next week. The T-Birds will host their best of three quarterfinals series against the Manitoba Bisons starting on Thursday, February 22 at War Memorial Gym.